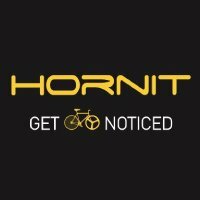 At 140 decibels, the Hornit is the loudest bicycle horn ever. Designed to fit any handlebar: road bike, mountain bike or hybrid. Sounding the Hornit will definitely alert other road users about to cut dangerously into your path. At 140 decibels, the Hornit is the loudest cycle horn ever. While bells are probably still best for shared walking/cycle paths, they're usually too quiet to be heard on roads over traffic noise. You can mount the comfortable silicone button close to the levers so you can brake and sound the Hornit simultaneously. The Hornet sounds like an electronic car alarm - you notice it but it sounds less aggressive than a car-style horn. Or shouting. When riding a cyclepath you can switch the Hornit to 'Park Mode'. 'Park Mode' emits a quieter 130 decibel beep. However, if you ever feel threatened on a path, sounding the horn at full volume may well deter an aggressive person (or dog). Expected run time: 6-12 months from 2 x AAA batteries. Compact bike light size - the horn measures 97 x 48 x 36mm. The Hornit attaches to a bar mounted bracket - just like most bike lights. Spare brackets are available to make it easy to switch the Hornit between bikes.